State Minister Senasinghe with Tobias Alando, Acting CEO Kenya Manufactures Association, High Commissioner Sunil de Silva, Indira Malwatte, Chairperson of the EDB and other officials. 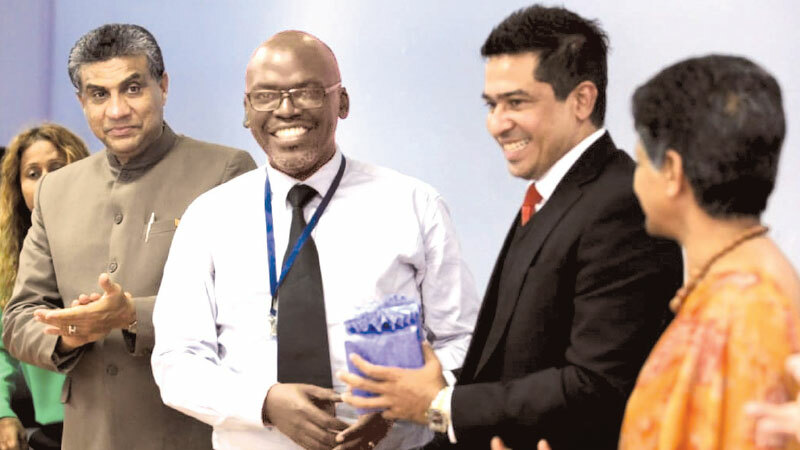 State Minister of Development Strategies and International Trade Sujeewa Senasinghe led a delegation of private sector companies to Kenya together with the Export Development Board (EDB). The State Minister addressed the Sri Lanka, Kenya Business Forum organized by the Sri Lanka High Commission in Nairobi where the private sector companies had the opportunity to meet prospective buyers, wholesalers and Kenyan entrepreneurs to further their businesses. The Kenya Chamber of Commerce and Industries (KNCCI) partnered with the High Commission to brief the incoming delegation on the business environment in Kenya and the opportunities available for Sri Lankan companies in the areas of fast moving consumer goods (FMCGs) and on the light engineering sector. The State Minister emphasised on the strategic location of both countries and explained as to how the two countries could mutually benefit in doing business. He stated that Kenya is the gateway to East Africa while Sri Lanka with its growing number of free trade agreements is the gateway of Africa to Asia. Commenting that both countries are not rivals in business but countries who could grow together complimenting and learning from each other, the State Minister said this is only the first step to many more visits that will strengthen the relations and understanding of the potential of growth of both countries. He thanked the Chief Executive Officer of the KNICC George Kiondo and his team for their efforts and welcomed a buyer delegation from Kenya to Sri Lanka. The State Minister also met Tobias Alando, Acting Chief Executive Officer of Kenya Manufactures Association(KMA). The Sri Lankan delegates had fruitful B2B discussions with Kenyan businesses jointly organised by KMA and Ruwan Fernando of Mayleen Group of Companies in Kenya. State Minister, Senasinghe also met Ababu Namwamba, EGH, Chief Administrative Secretary of Foreign Affairs to discuss trade related outstanding issues. Namwamba assured that Kenya will be hosting the 2nd Joint Trade Committee at the earliest. Appreciating the assistance given by Kenya in training long distance runners of Sri Lanka, the State Minister informed that Sri Lanka will assist Kenya in its efforts to improve cricket. The meetings were attended by High Commissioner Sunil de Silva, Indira Malwatte, Chairperson of the Export Development Board, Anzul Jhan, Deputy High Commissioner and Anoma Premathilake, Director Market Development of EDB. The private sector delegation comprised Hettigoda Industries Ltd, Ceylon Biscuits Ltd, Orient Lanka Confectionery Ltd, Synex Holdings and Synex International Pvt Ltd, St Theresa Industries (Kenya) Ltd. and Ceylon Agro-Industries Limited.